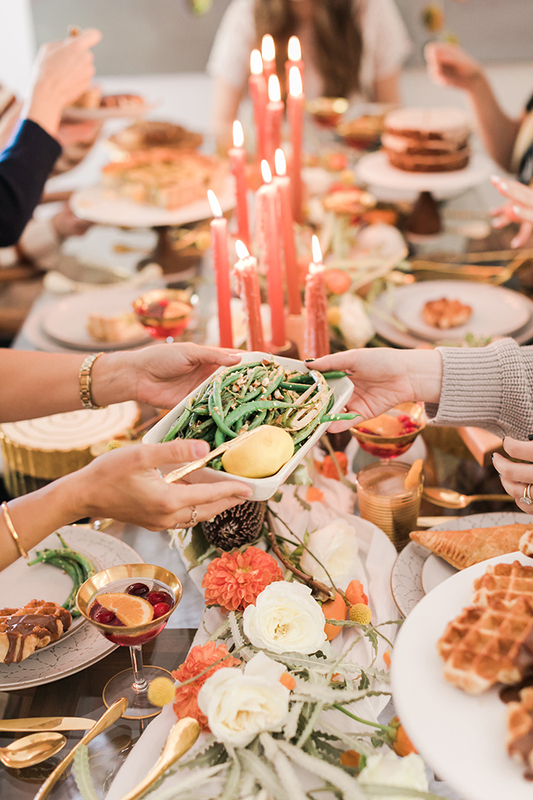 If you visited the site last week (or saw this Instagram post), you might have noticed that we were very excited to share the Friendsgiving Brunch tablescape that we put together at our friend Claire’s’ house. The day was full of fun and some of our favorite people… Rachel of Bonjour Fête and Royale of But First, Party! came by to help style everything to perfection; Laurel of Sweet Laurel Bakery baked grain-free sweet treats; and Claire of The Kitchy Kitchen concocted cocktails and four delectable savory dishes with fresh fall flavors. 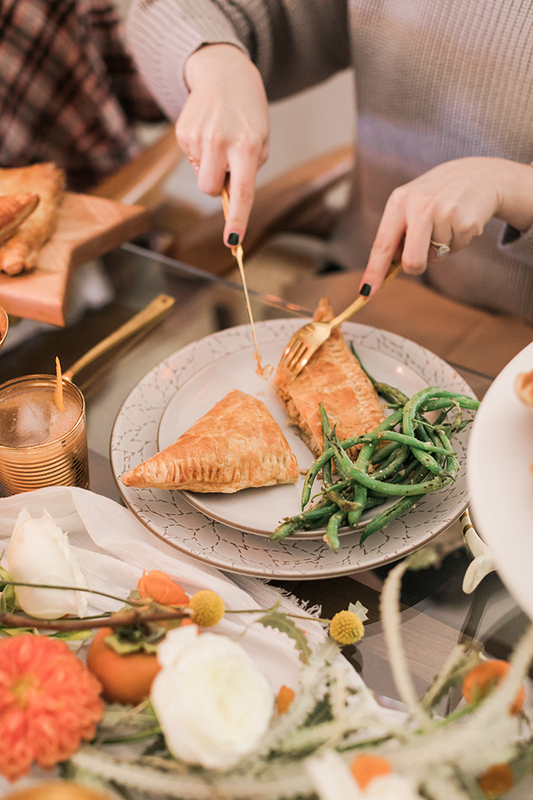 The concept behind this day was to put a new spin on your average Friendsgiving get-together by turning it into a fabulous brunch. 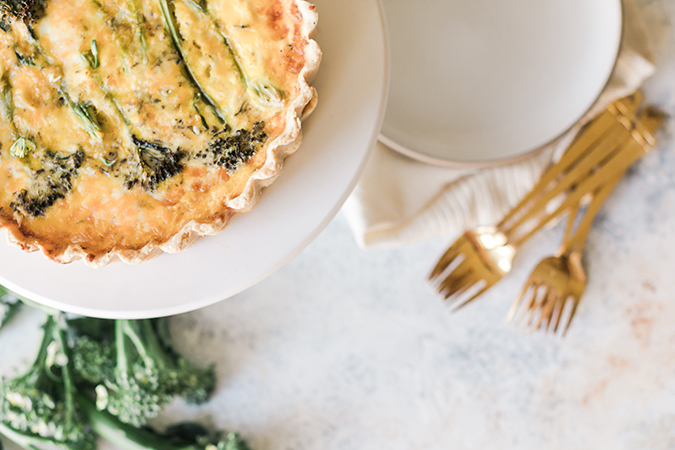 Our menu consisted of ingredients inspired by traditional Thanksgiving recipes, but in the form of favorite brunch dishes. 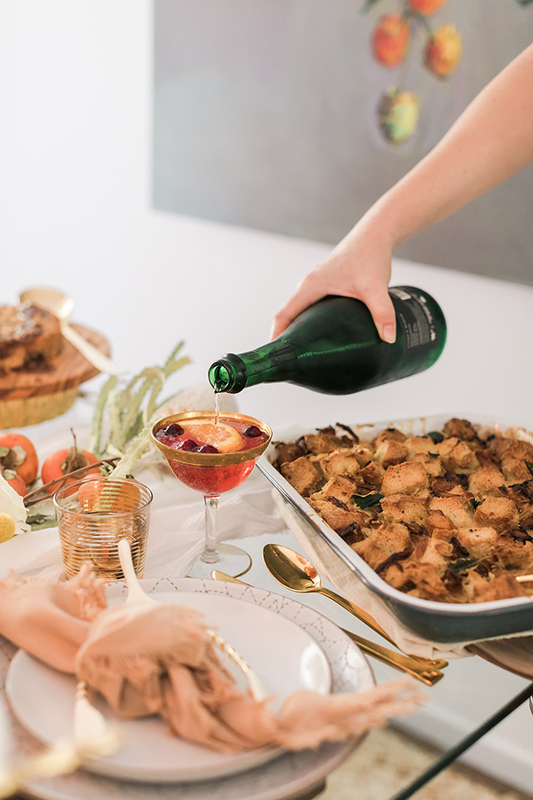 By the time our tablescape, cocktails, and dishes had been snapped from every angle, we were ready to taste the flavors we had been smelling all morning. At this point, hungry was an understatement! Claire served up Turkey Pot Pie Hand Pies, Broccolini Quiche, Butternut Squash Brown Butter Sage Bread Pudding and Butter-Blistered Green Beans (and two cocktails… but more on those next week!). We were eating like queens all afternoon. Let’s just say we all went back in for seconds… and thirds. ¾ cup roasted vegetables, yams, etc. 1. Mix gravy, turkey, and vegetables in a small bowl. Sprinkle with a little salt and pepper to taste. 2. Gently roll the pastry on a floured surface, just to thin it out a bit. Cut each sheet into 8 squares. Put 1/4 cup of the turkey mixture on a square. Dip your finger into cold water and run it around the a 1/2 inch edge of all the sides. 3. 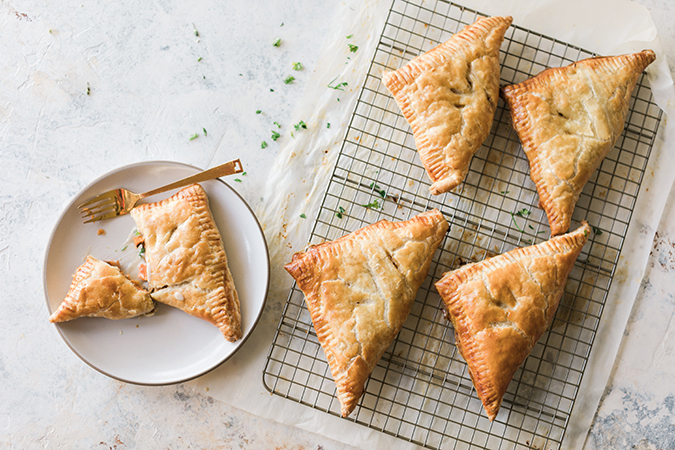 Fold over the puff pastry to form a triangle. Press gently with your fingers, then push the tines of a fork into the edges. Brush with egg wash. Cut vents in the top of the pie to let air escape. 1. In a food processor or quickly using your fingertips, combine the flour, salt and butter until the chunks of butter are broken down to the size of peas and the flour feels like wet sand. Add the first 1/4 cup of water and mix until the dough comes together easily. It’s too dry if it immediately clumps apart. Add two tablespoons of water at a time, you can always add more water but not more flour, so careful not to add too much! 2. Gather the dough into two balls and plop them on top of two sheets of plastic wrap. Loosely wrap up each ball and press down, smooshing the ball into a disc about an inch thick. 3. Pop them in the fridge for at least 30 minutes while you busy yourself with the other stuff. 4. Meanwhile, place the butter in a large, deep skillet and turn the heat to medium; when the butter melts is hot, add the onions, salt, and pepper. Turn the heat to medium-high and cook, stirring frequently, until the onions are very soft and golden brown, at least 20 minutes. 5. To make your crusts, start by preheating the oven to 425 degrees F.
6. On a lightly floured surface, roll out the pie dough to about 1/8-inch thick. Place inside a pie plate, pushing into the corners. Trim the edges and pinch. Prick the crust all over with a fork. Line it with tin foil and weight the bottom with a pile of dried beans or other weights that will sit flat on the surface. Bake 12 minutes. Remove from the oven and carefully remove the weights and foil; turn the oven to 325 degrees F.
7. Beat the eggs with the liquid and stir in the onions and half of the cheddar. Place the baked crust on a baking sheet. Pour the egg mixture into the crust, right to the top. 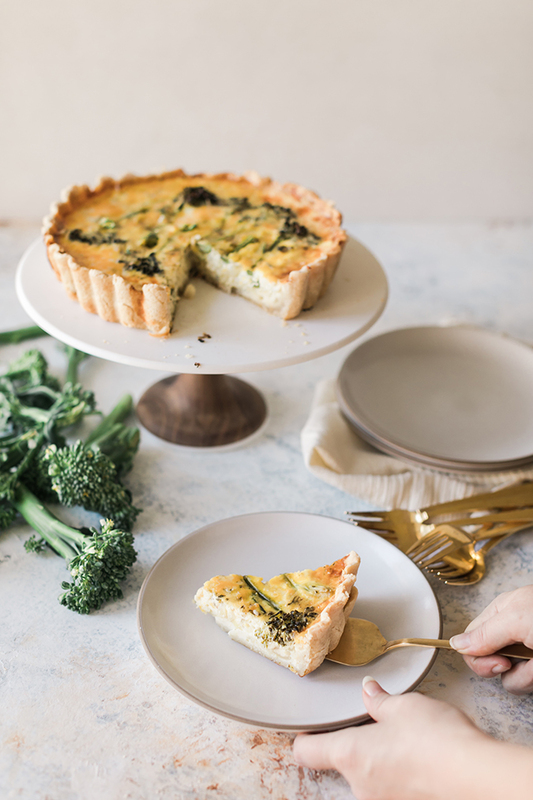 Finish with broccolini styled in a straight row, sprinkling cheddar on top. Carefully transfer the baking sheet to the oven and bake 35 to 40 minutes, until the mixture is set but is still moist; it should jiggle just a little in the middle. Cool on a rack and serve warm or at room temperature. 1. For the Caramelized Onions: In a large skillet, melt butter over medium heat, then add onions, and salt. Cook, stirring every few minutes, until onions have softened, about 30 minutes. Add wine and cook until liquid has almost completely evaporated, about 3 minutes. Remove from heat and set aside. 2. Preheat oven to 350°F. Spread bread in a single layer on a baking sheet. Bake until bread is dry but not browned, about 8 minutes. 3. Combine the butter and sage, and cook over medium heat until butter is browned, set aside. 4. In a large bowl, whisk together eggs, half and half or milk, mustard, Worcestershire sauce, brown butter and sage, 1/2 teaspoon salt, and pepper. Add dried bread and let soak in custard for at least 15 minutes and up to 30 minutes. Fold in the butternut squash. 5. 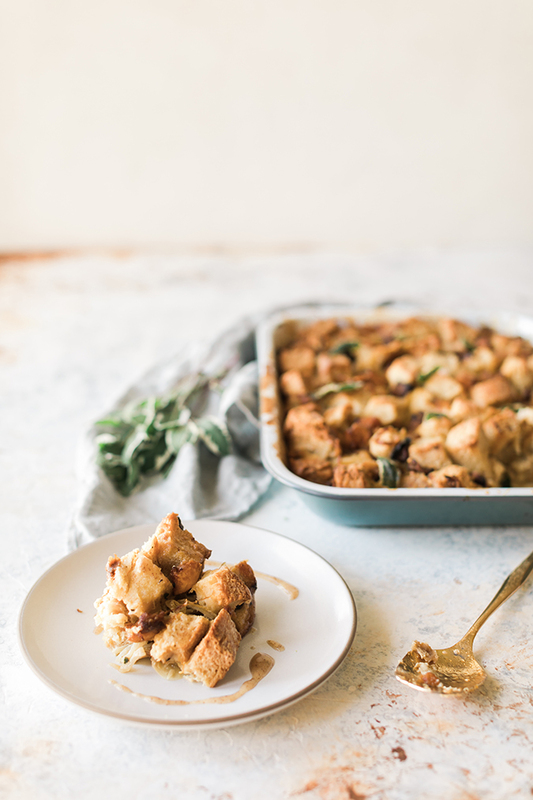 Butter a 12-inch cast iron skillet or a 9- by 13-inch baking dish and add half of bread. Scatter half of caramelized onions and half of cheese all over. Layer remaining bread on top and scatter remaining onions and cheese over. Drizzle any remaining custard all over, then bake until bread is crisp and custard is just set, about 35 minutes. Serve hot or at room temperature. 1. In a large pan over medium heat, melt the butter. 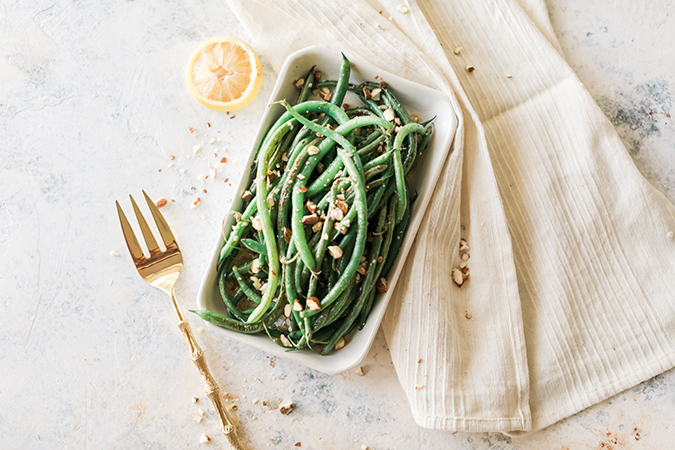 Once it’s clear and very hot, add the green beans. 2. Cook, stirring every now and then, until the butter is golden and the beans are bright green but with blistered spots. Add the chopped almonds, stirring to coat in the butter. 3. 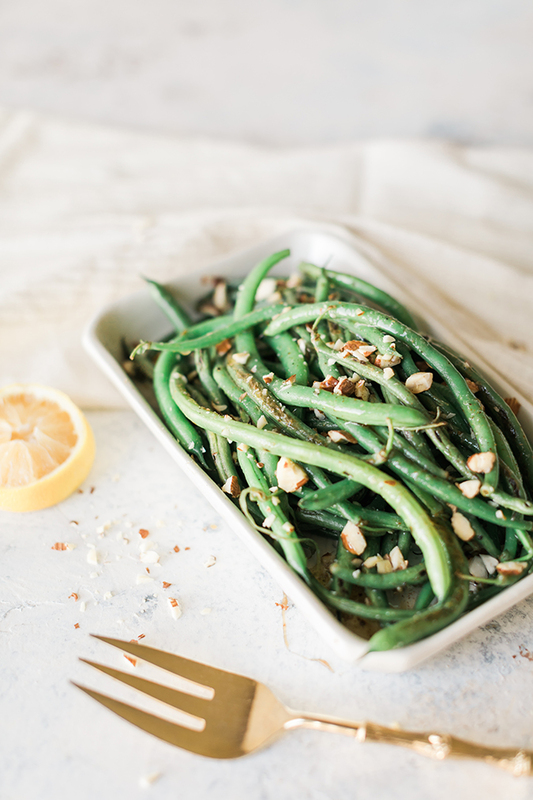 Once the butter smells nutty, remove the pan from heat and season the green beans with salt, pepper, and a squeeze of lemon. Plate and finish with basil. 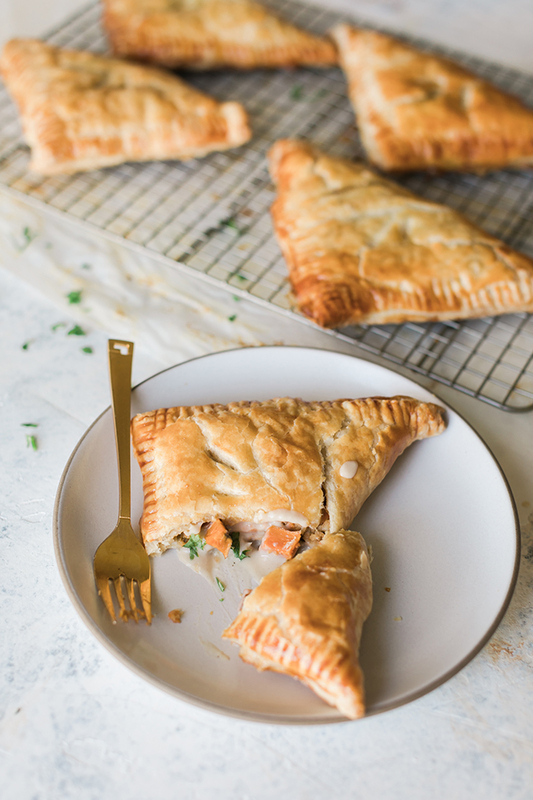 If these recipes don’t get your mouth watering, we don’t know what will. We’re craving this entire meal all over again! 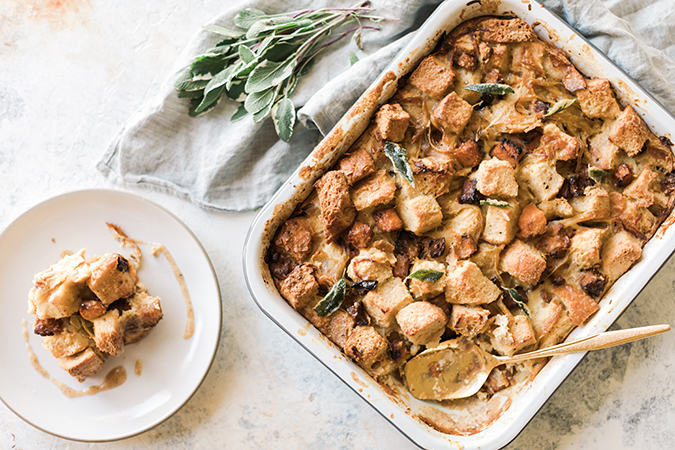 What twists will you put on your favorite traditional Thanksgiving recipes this year? 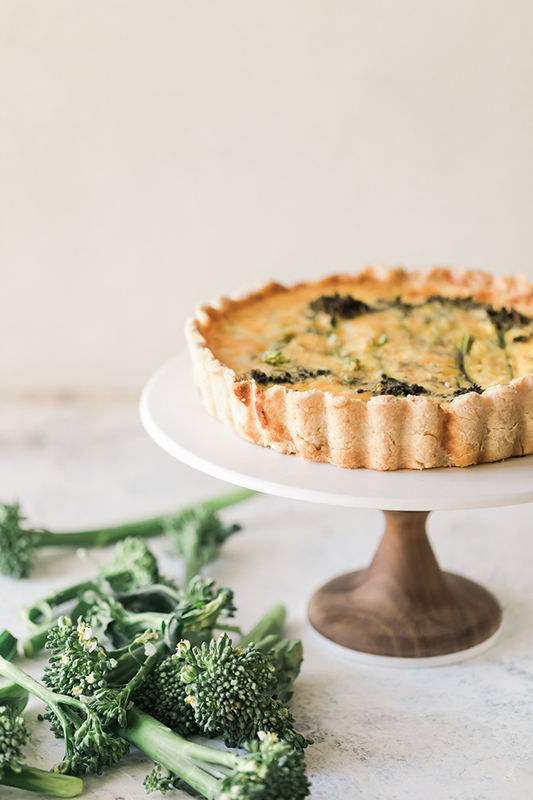 A big thanks to Claire of The Kitchy Kitchen for sharing these fabulous recipes with us today. Be sure to check back on the site this week and next for the dessert and cocktail recipes we served, too.